Please Say No, Lamar Odom. 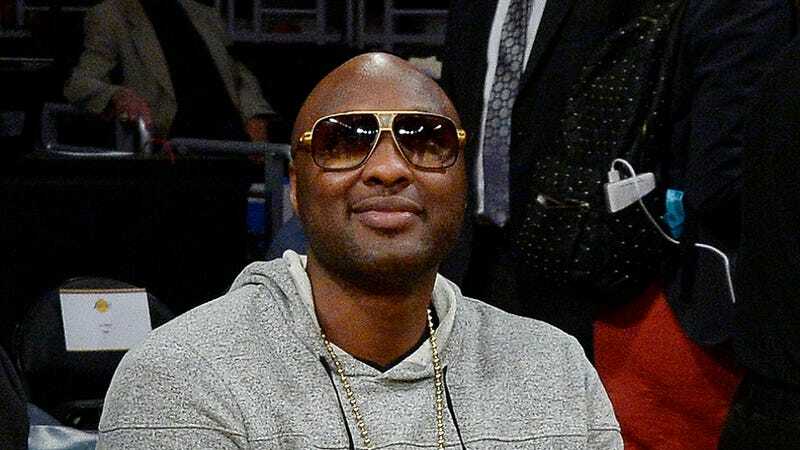 Less than a year after Lamar Odom’s near-fatal overdose at a Nevada brothel, the owner of said brothel is purportedly offering Odom an all-expense vacay to relive his worst nightmare, and is this an episode of Law and Order: IDK WTF? yet? According to TMZ, Tim Curry in It Dennis Hof is super into having Odom back at his establishment—aptly named the Love Ranch—because the prospect of revisiting the site of your near-death experience isn’t psychologically and emotionally damaging or anything. As well as inducing PTSD, I’m assuming Hof’s other interests include raising flesh-eating feral wombats and hiding under your bed while you sleep in it. “Hof says he has a strict NO DRUGS policy at his place—and thinks the companionship and some Remy Martin at the Love Ranch could be good for Lamar. The intent is sweet, but can someone please explain to me why this picture is so unnerving? ...oh God it’s the eyes, isn’t it.